my response would be the same every time. exceeded even my wildest imagination. changed my life, and the life of Collin. Then it kinda grew, and grew and grew. the Special Services Classes at my son's school. and offered 2 dozen up for Auction on my Facebook Page. and I AM The Cookie Puzzle. permission to use her cookies as inspiration! These are Jodi's cookies...NOT mine! 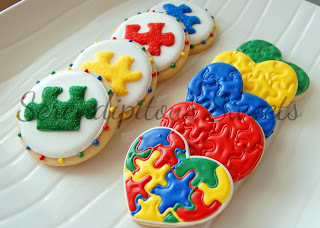 I have to tell you, when I saw these cookies, I cried! The quilted puzzle look just amazed me! They were perfect in every way. I post the auction, hoping that I might be able to raise $50 for the class. I was shocked once again! I was overwhelmed, Collin was stunned, and his teacher was amazed! We now had $225 to spend on the classroom! to get as much as we can. You will never know how much your generosity mean to these kids. things that let them know they are SPECIAL! being scared out of my mind. I made regular sized cookies! Every year, I make these for Collin's class! Almond Joys are my favorite! Sorry I have been MIA for so long! my second post this month. some simple pumpkin cookies I did! or angle of your pictures, your cookies can look totally different. Same cookie, same background, different angle! Same cookies, same angle, different background! Same cookies, same background, different angle, and zoomed! Same cookie, same angle, different background! How about a side by side comparison? So what did I learn about this? you are bound to get at least a few good pictures. and again, different angles, can give you a totally different look! Ohhh...I love me some candy! And I LOVE how they turned out! The candy themselves were super easy to make...wanna see? with a little water to attach them before baking. spooned the glaze over the cookies. Making sure all the sides were covered! I gave the pan a good shake, and tap, to even the glaze out. steal all my almond joys...but that is OK...I still love her! to link them up at her site! I can not wait...and already have plans!